The "Dragon's Demand" SoundPack gives you the complete audio solution when playing the "Dragon's Demand" Adventure. All the preparation is done for you, and every sound you'll need is right at your fingertips. The Dragon's Demand is a deluxe super-adventure for 1st through 7th level characters, and now with the amazing rich accompaniment of Syrinscape there are even more reasons to play this module. Is this Pathfinder Adventure SoundPack useful when I'm not running a Pathfinder Adventure? Founded by a famous dragonslayer, the small town of Belhaim has become a sleepy rural community just off the beaten path, a settlement where everyone knows everyone and strangers are the talk of the town. But when Belhaim's peace and quiet is shattered by the sudden collapse of the last standing tower of its founder's castle, things quickly bloom out of control. Why were there bodies of kobolds amid the rubble? What's the sinister secret behind the strange sounds of flapping wings in the night? And what's happened to local wizard Balthus Hunclay, who's not answering knocks on his door? This SoundPack includes samples recorded by Pathfinder fans and players at both PaizoCon 2015 and UK Games Expo 2015. Syrinscape thanks you and praises you for your spectacularly and slightly disturbing contributions! These SoundSets will appear by default in the Syrinscape Fantasy Player app, but you can make them appear in any of the apps by using the Campaign Manager. 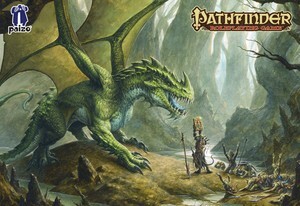 Pathfinder Module: The Dragon's Demand © 2013 Paizo Inc. Paizo Inc., the Paizo golem logo, Pathfinder, and Pathfinder Module are trademarks of Paizo Inc. Author: Mike Shel. SoundSet © 2015. Sounds created under license with Paizo Inc.